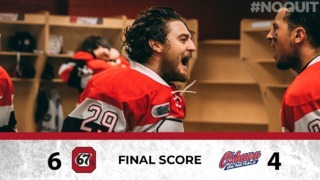 OTTAWA, ON – The final playoff positioning for the Ottawa 67’s will come down to Sunday’s regular season finale after the Barber Poles fell 5-2 to the Mississauga Steelheads on Saturday night. The 67’s were in this one all night but couldn’t quite find the late-game heroics of their previous game against the Steelheads. Ottawa fell behind midway through the first as Owen Tippett opened the scoring to give the Steelheads the lead. But the 67’s would even things up with five minutes to go in the second period thanks to Austen Keating’s 24th of the year. While a pair of Mississauga goals would put Ottawa in a 3-1 hole, they responded once again, with captain Travis Barron notching his 21st of the year midway through the third period to make it a one-goal game. After Nicolas Hague’s second of the game extended Mississauga’s lead, Tippett added his second of the contest into an empty net to give the Steelheads the win. The 67’s will close out the regular season Sunday afternoon at 2 p.m. at The Arena at TD Place against the North Bay Battalion. It is the 67’s annual St. Patrick’s Day Game with the team sporting special green jerseys for the occasion. Captain Travis Barron has three goals and an assist in his last two games. 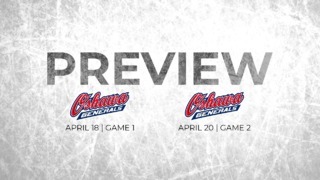 The 67’s will play either Hamilton or Barrie in the first round of the OHL playoffs, depending on the outcome of this weekend’s action. Ottawa needs a win against North Bay and for Mississauga to lose their final two games to clinch seventh. Ottawa outshout Mississauga 36-33 on Saturday. 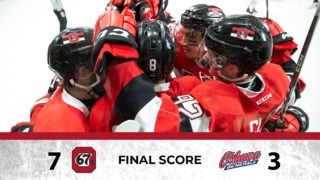 The 67’s scored on two of their four powerplays against the Steelheads.